Early in 2011 I discovered a new website: Project Conversion. In the midst of some personal trials and tragedy, Andrew Bowen had reached a turning point in his life: either continue on a downward spiral of anger and hate or choose to learn more about the different faith traditions he so despised. As a result, he launched Project Conversion, in which he immersed himself in twelve different religions, each for a month, over the course of 2011. This year-long journey was transformative, not only for Andrew, but for thousands of others who observed, participated, and learned along the way. I was fortunate enough to be one of those thousands. I admired Andrew's total commitment to each religion, and his openness in asking questions and accepting the faith on its own terms. In July, Andrew delved into my faith: the Church of Jesus Christ of Latter-day Saints. It was fascinating for me to see us and our practices through the eyes of a committed "outsider." And I was humbled and excited when he invited me to write a guest post for the month. The process of boiling my faith down to its barest, most essential elements was instructive for me. What do I really believe and what do I value most about my faith? I ended up with a brief essay I'm rather proud of. You can read it here. Following Andrew and Project Conversion during 2011 shifted so many paradigms for me. There was a fairly active facebook community that participated right along with Andrew, and new voices joined in as the experts-of-the-month when their faith was being highlighted. In some cases it was my first interaction with people of these particular faiths. The community was, almost without exception, open and welcoming, asking sincere questions for increased understanding, and generously sharing their stories and beliefs. It was a year-long experience in "holy envy". I loved the focus on joy in Hinduism and the Divine Feminine in Wicca. I learned about mindfulness from Buddhism and the value of less from Jainism. The difficulty - and importance - of being different was one of my take-aways from the Sikhs and the months of Judaism and Zarathushti taught me the significance of heritage and history to a people. Misconceptions were corrected, similarities were found, differences clarified and appreciated. It was an invaluable learning experience for me. And now Andrew has written a book! It's release date is February 5, but it's available for pre-order on Amazon right now as either a paperback or Kindle ebook. 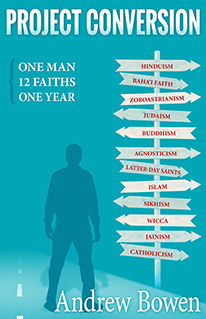 You can order it here: Project Conversion: One Man, 12 Faiths, One Year. Because I contributed to his Kickstarter request, I got an early release copy of the ebook (and I got mentioned on the acknowledgements page, too, so full disclosure and all...), and I've already finished reading it. I'll have a review up in the next day or two, but I'll tell you right now that it's good. Really good. I got all weepy and stuff. And filled with "holy envy" all over again, which is a good thing. So go order yourself a copy, and ask your local libraries to order a few copies, too, for good measure. **IMPORTANT UPDATE** Andrew just announced on the Project Conversion facebook page that starting at midnight Pacific time today - Monday, February 4 - and for the next 48 hours (until midnight Pacific time on Wednesday, February 6), the Kindle version of Project Conversion: One Man, 12 Faiths, One Year is FREE. All the more reason to jump on this ASAP. Go here to order from Amazon. Welcome to my Meridian readers!